Tuesday, December 4, 2018 - 12:00 p.m. to 1:00 p.m. Award-winning author Stephen Hess, as a 25-year-old recently discharged Army private in the 1950s, suddenly found himself as a part of President Dwight D. Eisenhower’s speech-writing team. Over the next decades, Hess played bit roles in aiding other Presidents from both parties. 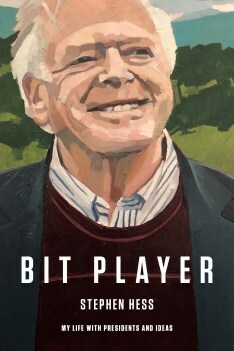 Bit Player is an insightful and often humorous look at how Washington works—or doesn’t. Chuck Todd, host of NBC’s Meet the Press, will moderate this discussion. A book signing follows the program.